My buddy Dudley Smith has done it again. He’s taken the latest release of my vSphere 4 card and blown it up for printing poster style. Also, just so you don’t think I’ve been resting on my laurels and letting everyone else do the work, here’s a little preview of what I’ve been working on. 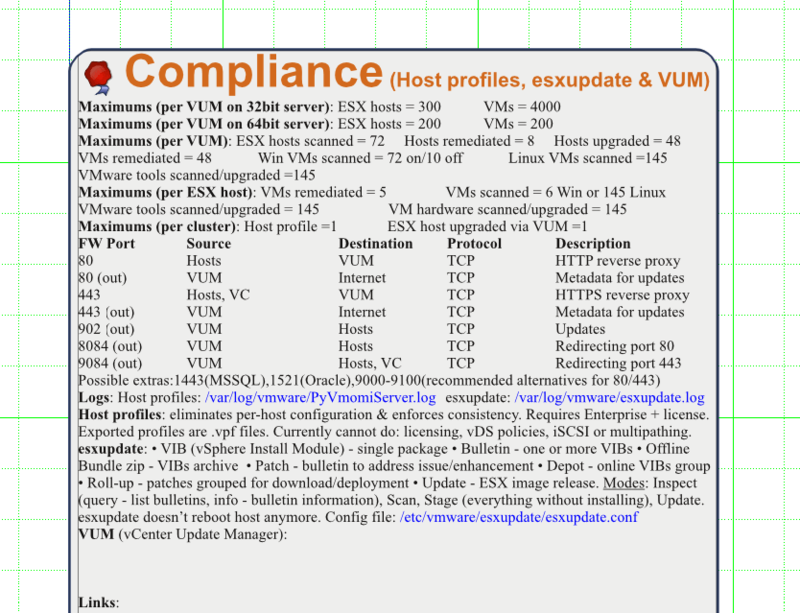 vSphere4 card – poster size document is not available in the link, could you please repost the same. Thanks for the heads up. I’ve fixed the link now. Forbes has done it again! Thanks for the reference card. Any advice as to the best size to print? US legal size a bit small for my bad eyesight. I don’t understand US print sizes too well, but I know you should be able to print out the regular card on A3 OK, if you scale it fit the paper. This poster version is scaled to 23.44″ x 35.26″, which I guess is pretty close to 22 x 34 poster size (ANSI D). Thanks for the link. However that PDF is regarding version 3.5. The documentation for TSO with vSphere is says you should only use the Enhanced VMXnet driver. See here. I think there has been problems with the e1000 support, and I think they are encouraging as many people as possible to switch to the preferred driver. Let me know if you find any other evidence though.